The most creative necklace design: how do we make it? A Twine is a beautiful piece of personalized jewelry, whereby two names or words are combined into one necklace pendant. 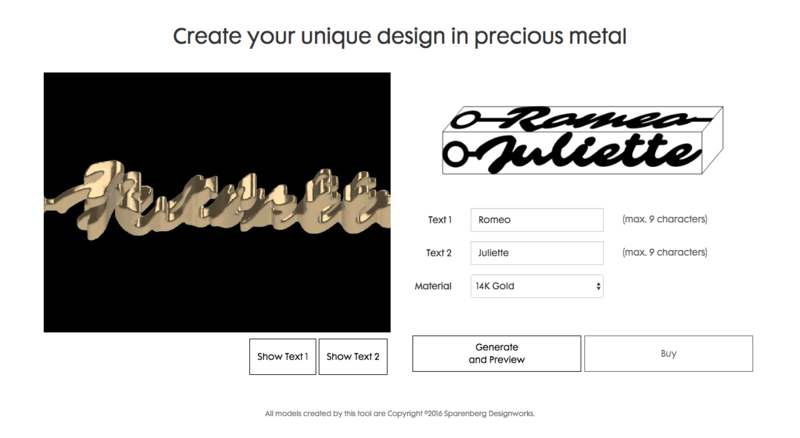 You can design this special necklace pendant yourself, with the help of our software, which gives you a perfect preview of what your pendant will look like. 1) Who can design a Twine pendant? Anyone with a computer, tablet, or smartphone can design a Twine pendant with our software using a webbrowser. 2) Where do I design my personalized Twine pendant? Go to www.twine.jewelry. Choose ‘Design in Precious Metal’ or ‘Design in Colorful Plastic’. Enter the 2 names or words you wish to combine and click on ‘Generate and Preview’. 3) Should I choose ‘Design in Precious Metal’ or Design in ‘Colorful Plastic’? That depends on which material you want your Twine pendant to be made of. Choose ‘Precious Metal’ for Twine pendants made from white or yellow gold, brass, or silver. For 9 different and vibrant colors, choose ‘Colorful Plastic’. The Colorful Plastic Twines are slightly larger than the Twines made of Precious Metal. 4) Which 2 words can I combine? You can combine any 2 names or words that you wish, as long as they are up to 9 characters long. For example baby names, or words like ‘love’ and ‘life’ and ‘happiness’. You can also combine a name and a date, or a name and a word. For example, ‘love’ and the name of your wife. Just make sure the words are not longer than 9 characters. 5) Do the 2 names or words need to be the same amount of letters? No, you can combine a long and a short name or word. 6) How do I know what my pendant will look like? After you have chosen your material and have entered your 2 names or words, click on ‘Generate and Preview’. Our special Sketchfab software will give you a realistic preview of what your pendant will look like. We have given a lot of attention to the different colors to make sure the presentation of the preview is as realistic as possible. 7) How long does it take for me to see the preview? Generating the preview can take up to about 30 seconds, so please be patient! 8) What is the price of a Twine pendant? There is no standard price for a Twine pendant. The price of the pendant you have designed will be given after generating the model. The price depends on the material you have chosen and the volume of the pendant. The prices between the materials gold, silver, and plastic, and the length of the names or words (volume) will dictate the price of your pendant. 9) How can I pay? Dutch and Belgian customers can choose between paying with iDeal, Bancontact/Mister Cash, SOFORT Banking, and PayPal. For our customers outside of the Netherlands or Belgium, Paypal is available. 10) Are my payment and my details safe? Always. We treat your details with the utmost respect and will never use them for anything else, unless we have your permission. Your payment is made within a safe payment environment. 11) How long will it take for my Twine to be delivered? Delivery of a Twine pendant is usually between 10 and 18 workdays, depending on the chosen material. Our plastic pendants take about 10-12 workdays. Silver and brass will be delivered in about 15-17 workdays. For 14 and 18 karat gold, the delivery time is about 18-21 workdays. 12) How can I see that my golden Twine pendant is made from real gold? Before shipment, your golden Twine will be hallmarked at a registered Dutch office. 13) Is there a necklace to go with the pendant? Yes. All of our golden Twine pendants are delivered with a (coated) golden necklace. A silver pendant will be accompanied by a silver necklace and a plastic Twine has a silk cord. The pendant and necklace come in a beautiful, luxurious box. 14) Do I have to be home for the delivery? No. All of our jewelry boxes fit in the mailbox, so you do not have to be at home for delivery. All our shipments are sent by registered mail. For the plastic Twines, you can choose from free or registered mail. 15) Can I return my Twine jewelry if I don’t like it? All Twine jewelry is personalized and specially made. Therefore, we make an exception to the standard Dutch return policy. In our Terms and conditions you can find more information about this. 16) What if I have a question that I cannot find the answer to on the website www.twine.jewelry? We want to be available to our customers as much as possible so we try to always be reachable by phone. If issues with the software arise or if you have questions, feel free to call us at +31-6-22586789.